Meet a variety of guests featured in franchises that include strong female characters. Have a suggestion? Let us know! From our roots as a Sailor Moon specific convention, we're expanding to bring your even more girl power fun! We will have lots of panels, activities, screenings, and even some video games. Join us July 20-21, 2019! From indie artists and small vendors all the way to exhibitors with official merchandise - there's something for everyone. Want to be a dealer? Apply here. 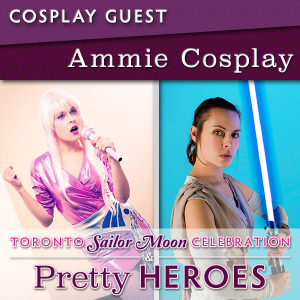 Ammie is a masters level cosplayer recognized internationally, particularly for her Sailor Moon and Harley Quinn cosplays. She has been featured in several cosplay books and various magazines around the world for her costume work and knowledge on costume construction. Ammie believes in sharing the knowledge she has gained through many years of trial and error to help others achieve masters status as well creating their own costumes with the pride of making their own costumes. She enjoys teaching workshops so people can have a hands-on experience in creating aspects of costumes to see how they are made and be taught in the process. Ammie is also the co founder of the Star Wars charity group Star Wars Echo Three. A group that started from only 2 people has now snowballed into close to 50 members. Very active in the community, Echo Three is now partnered with the Children’s Health foundation. Ammie believes in the benefit of using cosplay as a tool to help those in need whether it be bringing joy to those who are in the hospital or raising awareness and inspiring others who also enjoy cosplay to use it for the good it can do in helping those in need. Click here to sign up to volunteer and help make the event a success! We had an awesome time winning love by daylight and fighting evil by moonlight at our fourth annual convention in 2018. Our final attendance was over 1200 Sailor Moon and girl power fans and it’s clear that we need more space for more fun this year. Check out our highlight reel from 2017 by Tessellate Videos! We hope you will join us in 2019 at our fifth annual event under our new name, Pretty Heroes, in July – packed with even more girl power than before! See our photo album from 2017 here. See our photo album from 2016 here. 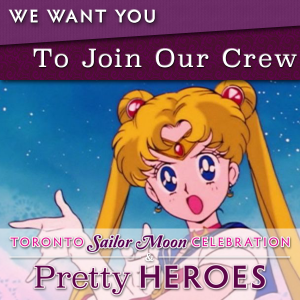 Pretty Heroes & The Toronto Sailor Moon Celebration are a joined convention dedicated to everything Sailor Moon and girl power. Run by Emily Gonsalves and a small team, our event is by fans for fans! Want to help out? Click here for details on how to join our team.